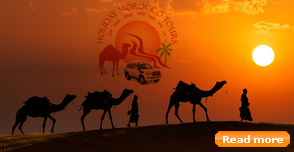 6 Days Agadir Marrakech desert tour will commence at 8 O’clock, driving by the 4×4 from Agadir to the spectacular town of Taroudant, also called “The little Marrakesh” because of its beautiful Medina and its massive ramparts. Then, to the heart of the saffron growing area of Tilouine, passing by the Tizi-N-Taghatine, and Tizi-N-Ikhsane mountain passes. We will continue, to Taznakht, to have lunch, which is a small town famous for its handmade Berber carpets, and Gelims. While spending a night at “Foum Zguid”, at the edge of the Sahara. After having breakfast, we will drive to visit the Iriqui Lake looking for some fossils, which was once full of fish and water birds, but now it is mostly dried up. Along the off-road piste,we will pass through various parts of the desert, Reg, the stony desert, and Hammada, while lunch will be at Chegaga, which is a far away part of the desert, where you can enjoy one to two hours camel ride, to see the stunning view of the sunset at the top of the dunes. We will spend a night at the Bivouac. We will drive 60km of the desert, after having breakfast, toward M’hamid passing by the Sacred Oasis. At M’hamid, we will visiting the ancestral , which is located in the old village, on the opposite side of the Daraa River, then to the longest valley in Morocco, the “Daraa Valley”, passing by its largest oasis “Zagora”, which is famous for its dates. We will continue through the ancient caravan route, a route used by the caravans carrying treasures, coming from Mali or Mauritania for days and weeks, and through the river, the Kasbahs, the mountains, and, the gardens. These views and places will help you see the beauty of Morocco, as well as made a clear idea about the way of life in here. We will reach Agdz to spend a night in the traditional guest house in our 6 Days Agadir Marrakech desert tour. We will visit the oldest and the most famous Kasbah in the Daraa Valley, after breakfast, in a time where few families occupied a part of it, other parts like the “Mellah”, and “the Jewish area”, are totally crumbled after the last inhabitants moved to Israel at the end of the 60s century. Then, crossing the bridge at Tansikht about 20 Kilometers to the south, in order to have a break, and have dinner in the small Berber town “N’Qob”. We will continue to the north toward Alnif, crossing by the Saghro mountains, the main tribe in these mountains was ” Aït Atta”, who were the last individuals to oppose the French occupation, then to Tinghir, Todra Gorges to have lunch, and finally spending the night at the Dades Valley. After having breakfast, we will have a walk around the Dades Gorges, then driving to Boulmane Dades, followed by Boutaghrar. Along the pathway, we can stop a while to share a cup of Moroccan mint tea with a Berber nomad family, then we will drive toward the Valley of Roses, where a rose festival is celebrated each year at the beginning of May, and in which the roses blossoms are used to produce the wonderful local oils, soap, and lotions sold throughout the country. We will continue to the Skoura Oasis, in which numerous ancient badly devastated Kasbahs located among the palm trees, then to visit Amridil Kasbah, a very beautiful one, and which used to be deposited for a period of time, on the old 50 Moroccan Dirham note, and finally to Ouarzazate, to spend the night in a riad, passing by the lake. After having breakfast of our last day of 6 Days Agadir Marrakech desert tour, we will visit the famous Kasbah, called “Ait Ben Haddou”, which was frequently used as a background for some unforgettable scenes of many masterpiece films, such as “The Gladiator”, and the “Lawrence of Arabia”, to have lunch, then, to Telouet Kasbah, which was once the residence of the Thami Glaoui Pasha of Marrakesh, and which is currently fully ruined after he fled the country following the departure of the French. We will finally reach Marrakesh by the afternoon, as an end to our 6 Days Agadir Marrakech desert tour, after passing by Tizi-N-Tichka pass.